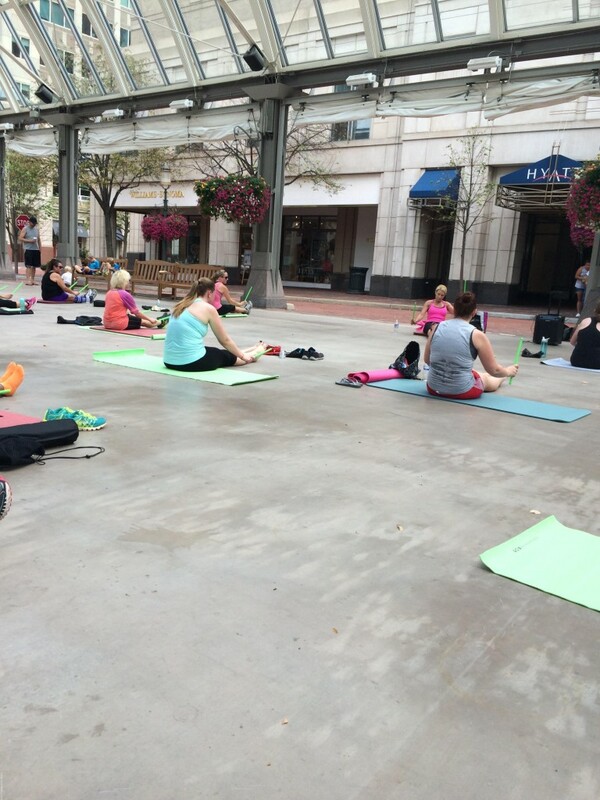 A few weeks ago, I was invited to come check out the Reston Town Center and the Reston Fit Club. 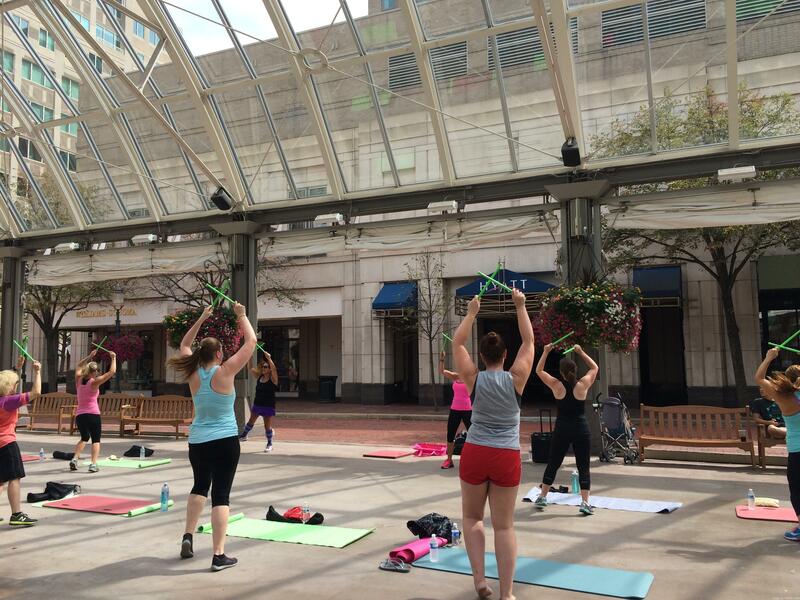 The Town Center has partnered with Athleta and they are offering a variety of free fitness classes every Sunday morning from 11:00AM-12:00PM under an outdoor pavilion through the end of October. I was pretty excited because I love to try new fun classes and this seemed like a great opportunity. Reston is about 45 minutes from my house on Capitol Hill in DC, so I decided to just make a morning of it. I invited my friend Mar to join me for a class, some lunch and some shopping. I’d never been to the Reston Town Center before and the words “free parking” made this DC gal smile (there is pretty much no free parking in DC). Through continual upper body motion using our lightly weighted drumsticks, called Ripstix®, you’ll turn into a calorie-torching drummer, POUNDing off pounds as each song flies by. Rock, rap, dubstep, pop and old school music fuse to create the POUNDtrack series, which is hand-selected by music enthusiasts, drummers and POUND founders Kirsten Potenza and Cristina Peerenboom. Okay, then. This wasn’t exactly yoga! It was up beat fun and I loved it. Our instructor was super energetic and it was just a lot of fun. Part of the fun was all the passerby shoppers who kept snapping pics of the crazy ladies dancing with green sticks. Such fun! After that major sweat fest, Mar and I decided to explore the Town Center. We grabbed lunch (side note: there are TONS of great restaurants here! I will be back for Mon Ami Gabi for sure!) and then wandered in and out of stores. Best thing about the suburbs: the shopping! Williams & Sonoma, Athleta, Paper Source and more! We actually ended up spending quite a bit of time wandering from store to store. I hadn’t been shopping in awhile (and didn’t buy much) so the window shopping was really fun! I would recommend you make an afternoon of it! Head to a free Fit Club class and then grab lunch and do some shopping. That’s what we did and it was a really nice day! Have you ever tried a POUND class? Did you love it as much as I did? note: I was given a free yoga mat, and a couple of gift cards to the Town Center in exchange for trying the Fit Club but did not receive any other compensation. All thoughts and opinions are mine! This sounds so fun! It’s always refreshing to try something new. So cool! I love the REston Town Center. I’ve run a few races that have started there. So many great restaurants and shops!! Looks like a very cool workout! It was awesome. You would’ve liked the class a lot, I think! It looks like that was a lot of fun. It’s always nice to be able to try something new and see where it takes you. That class was super fun. I had a blast! 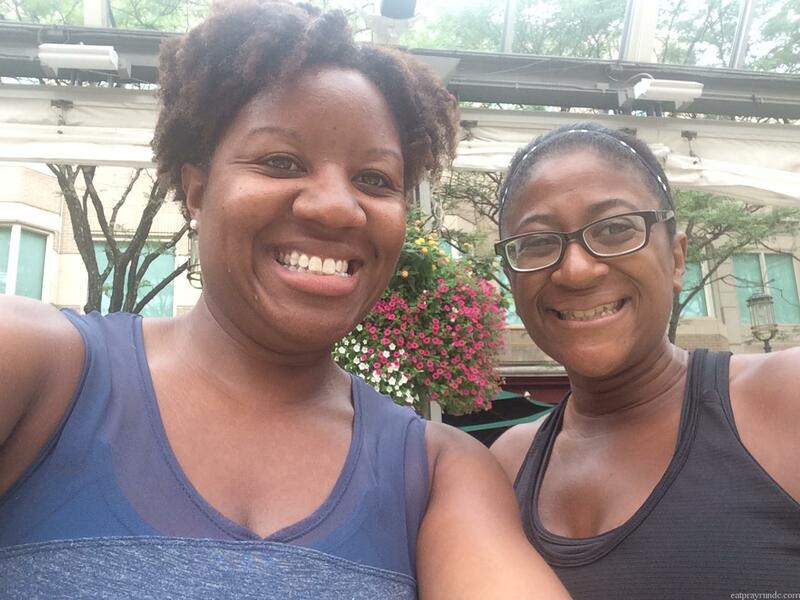 Superfun…I always hit up Athleta after a PRR race haha. I think there is a Paper Source in that shopping center as well. I’ve never heard of Pound. It sounds different and fun! I always thought those ripstix classes looked like so much fun and a great workout. I love Reston town center & meet my friends there a lot. Fun place! it was my first time there and i really enjoyed it! Is it just me or is being photographed by random shoppers totally awkward? I do not have an attractive work out face! Sounds like you had fun. I’ve been out there a few times, but not for workouts. Lots of cool restaurants and shops there. i was really impressed by how many cool restaurants were out there!! I love POUND. The drive to Reston … not so much, but there are cool things out there. hahaha, yeah it is a hike but once you’re there there’s enough to do to occupy you for awhile. Sounds like a really fun field trip! I’ve never heard of Pound but it looks cool! this was my first time hearing of it as well! if you ever have a chance to take a class, i recommend it! Its funny that you say that Reston is a hike for you, because I feel the same way about anytime that I have to go into the city, lol. You guys are having so much fun !! I am jealous. What a fun way to spend a Sunday afternoon! 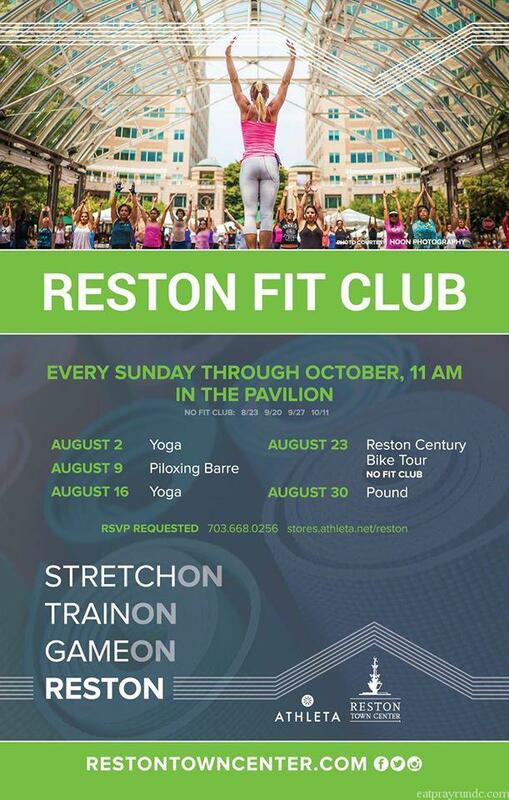 I have never been to Reston, but that is such a nice idea to have a class outside. Love the green sticks and I bet the music was cool too. Looks like you girls had a great day!! the music was ON POINT. i loved it! Oh, yeah def try it! You’ll love it!